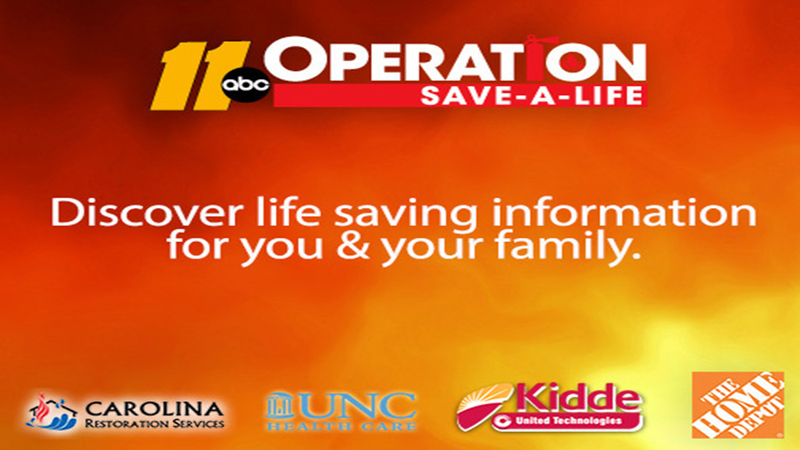 ABC11, along with local Fire Departments, Kidde, The Home Depot, NC Jaycee Burn Center and Carolina Restoration Services are proud to support Operation Save A Life. Every year, thousands of people die or sustain life-threatening injuries in fires. Many of these injuries and fatalities could be prevented through the proper installation of a working smoke alarm. That is the purpose behind "ABC11 Operation Save A Life", a massive community information and fire safety campaign airing on ABC11 for the entire month of October. Look for our educational campaign on-air, including safety tips on how to help prevent fires and carbon monoxide poisoning in your home or business, information on correct alarm installation and operation, and tips on how to establish a fire safety plan for your family. This year, on Wednesday, Oct. 4th at Cary Fire Station #1, ABC11 will present more than 4,000 10-year, sealed smoke alarms and 250 carbon monoxide alarms donated by Kidde, a worldwide manufacturer of fire safety products with headquarters in Mebane, North Carolina. The smoke alarms will go to fire departments throughout the Heart of Carolina. Local fire departments will deliver and install smoke alarms in homes of low income, elderly, and other residents at risk in their respective communities. Contact your local fire department to find out if you're eligible for a free smoke alarm. Offering advanced safety technology, Kidde's Worry-Free smoke, carbon monoxide and combination alarms are powered by a sealed, lithium battery that lasts 10 years to help provide 24/7 fire and CO protection while eliminating the hassles of low battery chirps and battery replacement. Kidde is one of the largest manufacturers of fire safety products and has generously donated the smoke alarms and carbon monoxide alarms to ABC11's Operation Save A Life program again this year. Each year we appreciate their wonderful donation. NC Jaycee Burn Center at UNC takes care of the people who have been injured due to fire, hot water, grease burns, etc. They are on the front lines just like our firefighters. We are grateful for all the work they do within the Heart of Carolina and their continuous support and sponsorship of Operation Save a Life. Carolina Restoration Services, our newest Operation Save A Life sponsor, handles everything from the immediate response when disaster strikes your home or business to the reconstruction needed to restore your property to the previous or better condition. We are incredibly happy to have them join us this year for our annual event. We would also like to take time to acknowledge the tireless efforts of our local fire departments; our heroes who run into danger as others are running out. Smoke alarms, combined with a strong program of fire prevention awareness, are vital to the efforts of our local fire departments that keep our communities safe and free of major fire disasters.